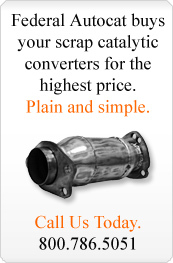 At Federal Autocat Recycling, we buy catalytic converters of every size and shape used in both automobiles as well as industrial applications. And we pay significant returns for them. Our proprietary grading technology makes being a customer a more enriching experience for you when you consider doing business with us. We have pick-up options across the lower 48 states and welcome your inquiries. Contact us to learn more about our catalytic converter grading process.